The first time I entered a book store after I bought my iPad I realized the current business model of physical book stores is dead. It’s like walking into a museum and realizing you’re witnessing something that won’t be there in a few years time. In a time where tablets and eReaders are becoming a real alternative to physical books even for the baby boom generation the clock is ticking for book stores like Barnes & Noble and Selexyz (in the Netherlands). And still I’m pulled towards browsing book stores. While shopping locally I take a stroll towards the book store and during my frequent travels I always pop into one. 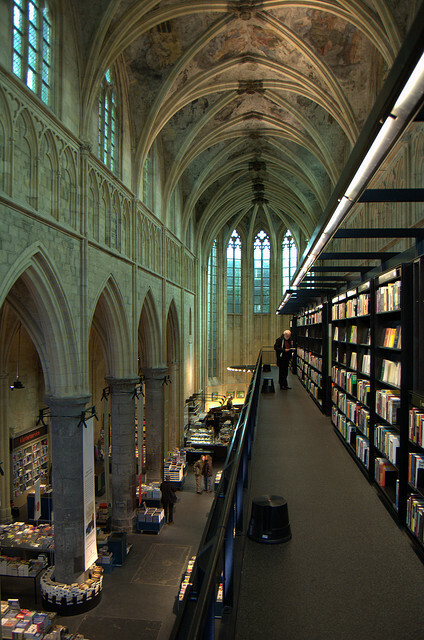 And there are some amazing book stores around the world! So I love the atmosphere and when I walk out I’m inspired. While Amazon offers suggestions, it doesn’t inspire me. There is something about holding a book, flipping its pages and loving the design. So it’s time to come up with a viable future proof business model for a book store. Selling your own eRearder will add another revenue stream to the declining physical book sales but for smaller independent chains that is not an option and competing with the likes of Apple and Amazon is a red ocean strategy. No, physical book stores need to get connected. They have to embrace the Connected Business Model. Each and every item they sell needs to be linked to an online store or mobile app. By scanning a QR code or by touching an RFID tag using their mobile phone equipped with near field communication the item could be saved immediately in the shopping cart of the online store. For each item the shopper can then choose to have it delivered as an eBook for their Kindle, Nook or Sony reader, as a PDF file for reading on their iPad or have the physical book delivered at home. They can pay all at the same time (maybe even in store) and enjoy their book when they arrive home. Of course the above is just the beginning of a completely new business model, where small independent stores could work together with a shared website/app and the store itself can be geared even more towards the experience by including a café, small library where you can borrow books and organize small scale events. There is plenty of opportunity but as always, it’s easier to stick to your current business model and get out of business (as happened to the Selexyz chain in the Netherlands) than to innovate your way into a new sustainable business model! Feel free to let me know if you want to work out the business model in more detail for your store!